Description: Batesville Local northbound approaching Papermill Road, a few miles north of Grenada. This was probably the best job to be on. They would go to work at 10:00, take their train 45 miles north to Batesville and return home, sometimes working 2 or 3 small customers, but somedays going straight there and back, usually getting off at 2 or 3 PM. Description: Batesville Local is making up their train at the depot. This was probably the best job to be on. They would go to work at 10:00, take their train 45 miles north to Batesville and return home, sometimes working 2 or 3 small customers, but somedays going straight there and back, usually getting off at 2 or 3 PM. Description: One of maybe the few remaining ex-GM&O GP38s still operating on the CN-IC is this unit that was incharge of the turn to Grenada, MS. Title: Working on a Saturday between Terry and Byram, Miss. Description: Between Terry and Byram, Miss. Description: Sitting in the yard at the Ham, with a northern cousin. Description: Lots of CN power over at Pershing Road. Description: Over by the engine facility. IC 9612 is inside the facility is getting refueled. Description: GTW and ex-IC in the yard. Description: A collection of GTW and ex-IC GP38s in the yard. Talk about power. Description: Taking some cars to CSX. Description: Local power at the CN Grand Avenue/Decatur Yard. Description: Light engines hurrying back to the yard so a southbound CN can come through. Description: Local power idling in a snowy CN Decatur Yard. Description: It's been seven hours and the air is still not pumped up enough to get going. It will take another two hours before they can get under way. Description: Finally after nine hours of pumping the air up the empty CN Cedar Rapids coal train is under way and is heading south at track speed on the CN Peoria Subdivision. With the temperature hovering around zero degrees life on the railroads was pretty much at a stand still this day. Description: After taking nine hours to pump the air up on there train the empty Cedar Rapids coal train heads South through the town of South Pekin along the CN Peoria Subdivision. Description: Interchanging cars for CSX. Description: 1032 has just brought in mixed freight A431. 9564 is on yard duty. 6191 came in with grain train L550. 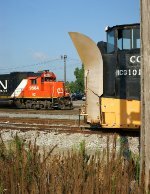 Description: Pair of IC locomotives in the yard near Railroad Avenue in Decatur. Description: In the CN yard.